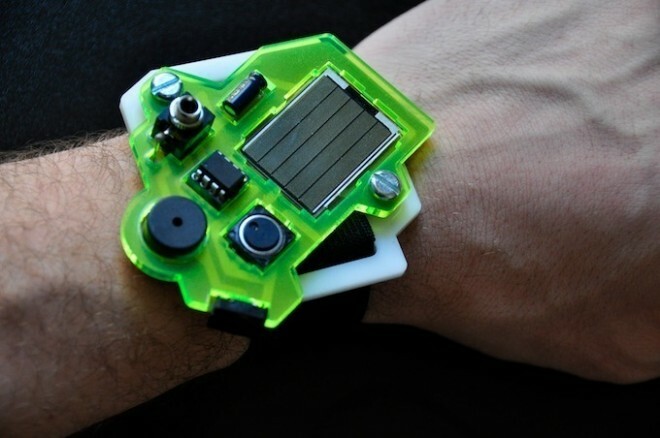 DIY electronic music makers, warm up your soldering irons: A pair of hardware hacking designers have created a miniature two-button, solar-powered synthesizer with a 3-D printed wrist-strap housing, and the full set of plans are posted online for you to make your own. Most synthesizers take the form of piano keyboards, with multiple octaves of black and white keys and a batch of knobs that turn sine waves into a sawtooth among a million other audio tweaks. The product from Lucerne-based artists/designers Felix Bänteli and Roman Jurt is much, much simpler. It comprises a small plastic casing with a nob and a mini jack on either side of an ATtiny13, flanked by a piezo speaker and a tiny solar panel. That panel gives the device the ability to make and tweak sound — either privately through the headphones or publicly through the speaker — anywhere one desires. The synth began as one of Bänteli‘s creations, who spent three years developing it in part with the tourist community in mind. “The actual idea was to have a DIY watch as a community souvenir out of Switzerland,” he explains. “But the main inspiration is to open people to DIY culture and show artists how to design their own music instruments and sounds. Sharing his design in various workshops, Bänteli encountered Roman Jurt, the lab manager at Lucerne’s FabLab. Jurt was immediately intrigued and began working with Bänteli to modify his creation. The solar panel aspect makes this synth uniquely portable. It was also one of the more challenging elements in the build. Despite the warning, over 100 of these wearable devices have been built, providing instrumentation for “lots of little fun concerts.” But Bänteli notes that it’s just a simple chirping thing based on pre-existing circuitry, and that they’re still developing new sound programs for it. Full electronic schematics and 3-D printable STL files are available on Thingiverse.